Cobblers boss Chris Wilder has hailed the ‘great gesture’ of chairman Kelvin Thomas to freeze season-ticket prices at Sixfields for next season. More than 200 season tickets were sold on the first day of sales on Wednesday with fans responding positively to the club’s decision to keep prices the same, even if the team is promoted to league one next season. With seven games of the season remaining, Town are a handful of points away from achieving that promotion and the league two title, and Wilder believes the decision to freeze prices shows the respect the chairman, and the club in general, has for its supporters. “I think it’s a great gesture from the chairman in a time where you see clubs at that top level just taking the mickey out of supporters,” said Wilder. “A lot has been talked about what happened at Liverpool, in the Premier League and whatever, with clubs charging £71 or £72 for a ticket. “Football always has been and always will be a working-class sport, played and supported by down to earth football people and people that love the game, so it is a great gesture (to freeze the prices). The support for the Cobblers this season has been spectacular, both at Sixfields and on the road, and Wilder is delighted the club is rewarding those fans for their backing. And he has also declared they will never be taken for granted by him, the players, or the chairman. “It is tough supporting football clubs up and down the country, like our supporters have done for us,” said the Cobblers boss. “Hopefully out supporters will see what is happening at this football club and see they will be treated with total respect by the chairman, because I know how he works. Wilder was talking ahead of Saturday’s Sky Bet League Two clash with Notts County, which is set to see the east stand at Sixfields reopened to fans for the first time in almost two years. The club is still waiting on the all-clear for tickets sales to start from the Safety Advisory Group, but they are confident that will be given ahead of the weekend. 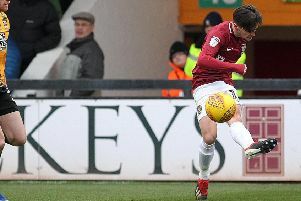 The Cobblers will have a chance of sealing promotion on Saturday, providing they beat County, Accrington lose at home to Cambridge United, and Bristol Rovers fail to beat Crawley. Aside from long-term injury victim Paul Corry, Town have a clean bill of health for Saturday’s game, with skipper Marc Richards suffering no reaction after his first game after six weeks out with an Achilles problem.